"The Congress shall . . . exercise exclusive Legislation . . . over such District (not exceeding ten Miles square) as may . . . become the Seat of the Government of the United States . . . ."
No issue so threatened the fragile American Union as the question of where to locate its capital city. In 1783, in recognition of the sectional division of the Union, Congress decided to have two capitals, one on the Delaware River near Trenton and the other on the Potomac. A year later Congress voted to establish a single federal town near Trenton and to meet in New York City until buildings at the capital were completed. Southerners blocked appropriations for the construction. Consequently, Congress remained at New York City despite repeated efforts by the Pennsylvanians and Southerners to bring them back to Philadelphia, the seat of Congress from 1774 to 1783. 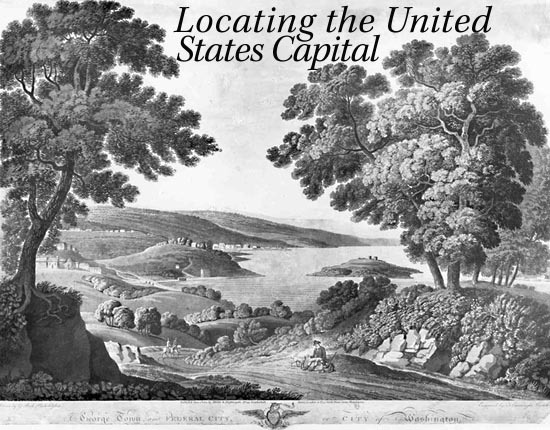 Late in August 1789 the First Congress took up the question of locating the federal capital. After a bitter debate between representatives from north and south of the Mason-Dixon Line, the House agreed to a bill retaining New York City as the temporary residence and locating the permanent capital on the Susquehanna River in Pennsylvania. Most representatives expected Wright's Ferry, renamed Columbia in 1788, to be the specific site. Instead the Senate named Germantown, seven miles north of Philadelphia. At the last minute, Madison managed to have the bill postponed until the second session. Copyright © 1999 First Federal Congress Project. All rights reserved.